Call her the Kevin Bacon of Congress. Democratic Rep. Terri A. Sewell of Alabama is one of only a handful of people who can say she knew Barack and Michelle Obama before they knew even each other. Her friendship with Kirsten Gillibrand goes back so far that Sewell calls New York’s junior senator by an old nickname: “Tina.” And nearly 30 years ago, Sewell recruited Susan Rice, the woman who would go on to become National Security Adviser, to join a gospel choir. Sewell&apos;s youthful encounters with future prominent leaders are notable, even for the standards of the Ivy League schools she attended. But the self-described “little girl from Selma” says a greater force was at work. “As a Southerner steeped in the church, I do believe in divine intervention,” Sewell told CQ Roll Call. Sewell grew up in the Deep South in the aftermath of the Civil Rights movement. She came from a modest background in an economically poor region. Her mom was the librarian and her dad coached basketball and taught math at the local public high school, where Sewell was selected as the first black valedictorian in 1982. She describes her freshman year at Princeton University as brutally tough, saying she felt as if she was “playing a fast game of catch-up” among students groomed at Andover and Phillips Exeter. But she also points to that time as the pivotal moment in her trajectory. To guide students like Sewell through the transition, Princeton matched minority freshmen with upper classmen mentors. Sewell assumed her “Big Sis” would be another black student she knew from Alabama. Instead, a different woman entered her mentor match meeting. After graduating from Princeton in 1986, Sewell earned a Marshall/Commonwealth Scholarship at Oxford University. While there, she struck up a friendship with Rice, then a Rhodes Scholar. She, Rice, and a handful of black female Oxford students had a standing lunch every Friday at a local restaurant, The Nosebag. The pair pursued their passions at Oxford. For Sewell, it was performing on stage; for Rice, it was basketball. The play called for a cast of seven African American women. Sewell held auditions over a Monday and Tuesday, but only one person showed up. With her play falling apart, she went to her regular lunch with the Nosebag crew. “Friday comes and, I walk in, and I’m like, ‘Oh hell, here is the rest of my play,’” she said. Rice told CQ Roll Call in an interview she still remembers being recruited for the gig, "along with several others of us that she forced into service." “It was my first and only acting experience," Rice said. "It was a heck of a lot of fun." Another Rhodes Scholar named Ben Sherwood also chipped in to help with the production. These days he is the co-president of the Disney/ABC Television Group. Sewell also talked Rice into what she now describes as “probably, the first-ever and maybe the last gospel choir at Oxford." After Oxford, Sewell followed Robinson on to Harvard Law School. By the time Sewell arrived in Cambridge, her former Big Sis already had graduated and returned to Chicago. 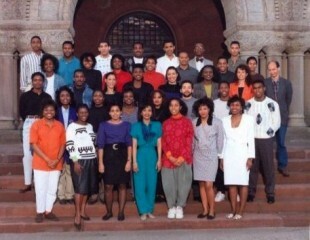 A photo hangs in Sewell’s congressional office of the black students in her law class. It includes a litany of future administration officials, judges and former “CSI: New York” star Hill Harper. Then there&apos;s the guy who would one day become the nation&apos;s first black president. The congresswoman sheepishly concedes that the 20-something Barack Obama wasn&apos;t the person from that group she would have imagined would go on to lead the free world. He was the second-most likely. “If I could say what makes the difference between the person I thought could have been the first black president in this picture, and the one who is, the difference is Michelle Obama,” Sewell said. Sewell began work in 1994 in New York City at Davis Polk & Wardwell, one of the most elite law firms in the country. She met Tina Rutnik, a young litigator who was enthusiastic about squash, tennis and Hillary Rodham Clinton. Sewell describes the woman as having "a lot of balls." They formed a fast friendship and Sewell joined her new pal as she hosted a young women lawyers event for Clinton at the Russian Tea Room. It was Sewell&apos;s first political contribution. But both women eventually made their way back to their homes in Alabama and Upstate New York and lost touch. But one fall day, Sewell&apos;s secretary announced a call: "There’s a Congresswoman Kirstin Gillibrand on the line." They chatted, with Sewell confused about why the woman on the other line was talking her up as a possible female congressional recruit while on speakerphone with other female members in the room. “Congresswoman Kirsten Gillibrand ... ” Sewell responded. The rest of the exchange went something like this. Sewell shouts for emphasis as she retells the moment from six years ago. The biggest mystery of all, in Sewell&apos;s mind, is how she escaped Gillibrand’s fundraising calls in the years leading up to the recruitment pitch. Gillibrand would soon be appointed to the Senate, but still took ownership of Sewell’s fledgling campaign, offering advice on political consultants, tactics, and most of all, fundraising. “I just really became her No. 1 cheerleader,” Gillibrand said. The new senator would role-play with Sewell to teach her how to call donors. The lesson: Ask for a specific dollar amount and then remain quiet. Both Gillibrand and Rice personally donated to Sewell&apos;s campaign, but Rice, then serving as ambassador to the United Nations, was limited because of her role in the executive branch. Sewell won handily and is about to enter her third term. These days, Sewell is quick to emphasize her ties to her district back home and her efforts to boost her hometown&apos;s economy. But she also keeps in touch with her famous friends. Early in her freshman term, a tornado ravaged her district. 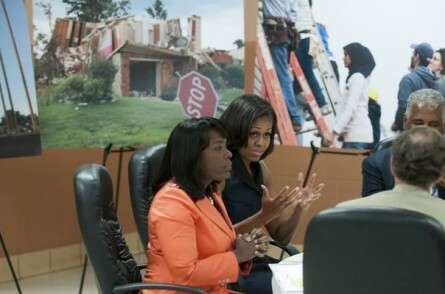 When the Obamas toured the wreckage , Sewell was on the airport runway to greet them. And she recently attended Rice’s birthday party, with special guest Aretha Franklin.